A space probe that aims to be the first to “touch the sun” is slated to launch this weekend, marking the next step in an effort that scientists say has been 60 years in the making. 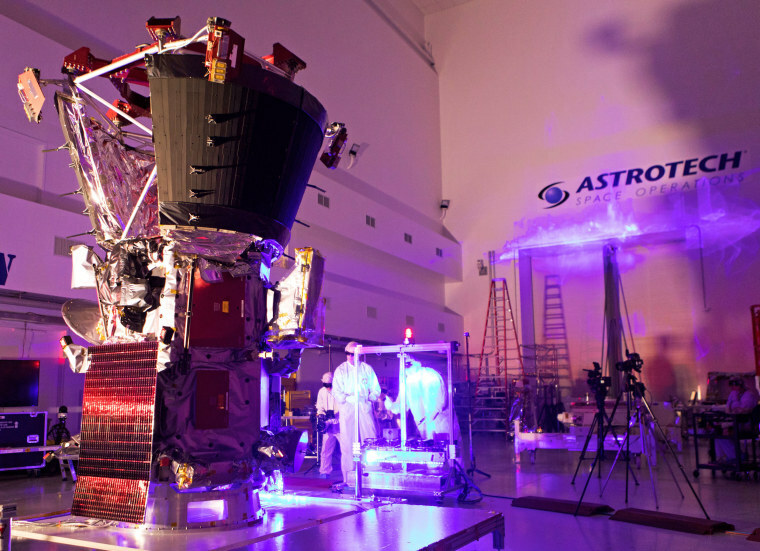 NASA’s Parker Solar Probe will lift off from the Cape Canaveral Air Force Station in Florida on Saturday, Aug. 11 at 3:33 a.m. EDT. The $1.5-billion, car-sized spacecraft is designed to provide a close look at the sun’s atmosphere — what astronomers call the corona — to answer enduring questions about this ultra-hot region of our nearest star. Over the course of its seven-year mission, the probe will orbit the sun 24 times, each time sweeping through the corona, where the temperature is a blistering 2,500 degrees Fahrenheit (almost 1,400 degrees Celsius). The spacecraft and its suite of delicate instruments will be protected from the sun’s extreme heat by a carbon fiber heat shield. At its closest approach, the probe will be just 3.8 million miles above the sun’s surface. And as it draws near, the spacecraft will be accelerated by our star’s intense gravity to a stupendous speed — estimated to be 430,000 miles per hour. That will make the probe the fastest human-made object, eclipsing the twin Helios probes that zoomed along at 157,000 miles per hour on their sun-circling trajectories. Space scientists have spent decades trying to understand how energy moves through the corona and what drives the flow of charged particles that the sun continuously casts off. Solar physicist Eugene Parker first predicted the existence of this stream of high-energy particles, known as the solar wind, 60 years ago. NASA’s probe is named for Parker, making it the first time the agency has named a mission for a living person. It’s important to understand the corona because it’s the breeding ground of vast and potentially destructive blasts known as solar flares and coronal mass ejections. When these streams of plasma and energetic particles strike Earth, they interact with our planet’s magnetic field, generating beautiful northern and southern lights. But they can also jeopardize the safety of astronauts aboard the International Space Station and the integrity of electrical grids on Earth. The probe should give scientists a front row seat to all this action. Eventually, when the spacecraft runs out of fuel, it will disintegrate as it gets pulled lower and lower in its orbit around the sun. NASA’s live broadcast of the Parker Solar Probe launch will begin at 3 a.m. EDT on Saturday. Want more stories about the sun?